A few pics from my Penelope Red Preview Party event in April. Almost every time I create the Jigsaw Skivvy, I am making a one of a kind or one of a very limited few (usually up to three). 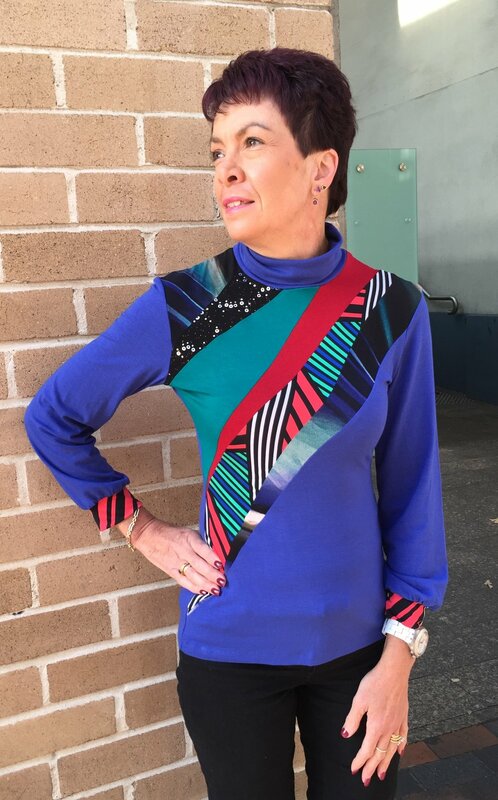 This womens jersey knit top features a very unique geometric design on the front, that is cut into seven pieces and has contrasting fabrics and textures on these pieces. Below you can see some of the versions I have created with this style, and just how versatile and unique it can be just by changing the combination of fabrics. My regular customers have often said that one of my talents is how I mix colours and print combinations together, as well as how I cut a design up into sections or how I cut the fabric up to create something different each time. So the beauty about this Skivvy or turtleneck design is that it combines all of this! I started creating skivvies because I am always cold in winter! I tend to feel it mostly around my neck and shoulders and back, and I wanted to look fashionable, while still being warm and comfortable. Ever since having my little boy and being a mum I also wanted to have something that I could easily wear with jeans in the park, but then it would also look nice going out too. A skivvy with a black jersey knit body and a contrasting design in red lace, red, blue and green paisley and a red jersey knit. A bright blue version of my Jigsaw Skivvy, with a bright blue jersey knit body, and a cream lace, and printed contrast. Leanne wears a custom made bright red version of the Jigsaw Skivvy. Leanne wears a one of a kind Pink and printed Skivvy that I designed especially for her. I am thinking I might have to make something similar like this next winter! I am wearing a bright blue and pop art inspired version of the Jigsaw Skivvy. One more copy of this version is available. I think the colours and prints on this version of the Jigsaw Skivvy are virtually perfect with each other! One of my favorites! A black, white and paisley Jigsaw Skivvy. In this design the black, white and purple is the main focus. There are still many other colours in the design, but the focus is on the three main colours. A custom order again. The customer wanted some sparkle! So the black triangular piece has sequins on it! A black jersey knit Skivvy blouse with contrasting colours and prints of Aqua, purple, white and pink. I am wearing my own one of a kind version of this Skivvy design. I love how these colours and prints work so well together but yet are so different! I am not a big fan of black, so if I make anything black for myself, it needs to have something with a bit of pizzazz! I think this fits the bill! Lorelle wears a Penelope Red Jigsaw Skivvy Turtleneck Top in a black jersey knit with contrasting fabrics in shades of red, orange, brown, black and white. The photos included are just a small selection of the variety available and what I could possibly create. If you would like your own custom made Jigsaw Skivvy, then please don't hesitate to contact me.